Hello. Unfortunately, my post is going to be a bit short today as I've spent a bunch of time tonight trying to figure out why my comment form is misbehaving. Apparently comments aren't always getting posted the first time people click post. So, try clicking an additional time if that happens to you. Also - please email me if you are experiencing this issue, as it will hopefully help me get to the bottom of what is going on (I'm also happy to post your comment for you). So, even though the posting is a bit short, rest assured the food I picked to blog about today is still a great find and is really yummy. 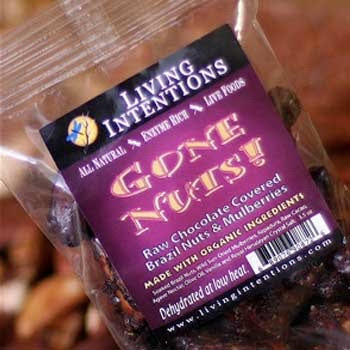 A company by the name of Living Intentions creates this delicious, gently dried raw mix of cocoa, sprouted almonds and raisins called "Gone Nuts" that is really to die for. The vegan and gluten free mix is crunchy and chocolately and even a bit gooey - but in a good way (you can still eat it with your hands without making a mess)! The best part is that the mix is only 103 calories per 28 gram serving, with 4 grams of fat, 2 grams of fiber, and 2 grams of protein (so 2 weight watchers points). Hi Juliet, thanks for sharing so many yummies! I think it will be nice to give more info about where you bought it and where we might find it. I really want to try them! Thanks, Juliet! it's in my list for next whole food trip!